Autumn is blowing its way in, the leaves are turning and we’re in full swing as we plan the second of our seven colour installations. At the end of October, the colour orange will feature in the stunning woodlands of Glencoyne Park above Ullswater where old, veteran and ancient trees grow in abundance. It won’t just be the leaves of the trees that are changing – we’ll be adding an additional dash of orange along the woodland path, just for a couple of weeks. We have walked to the Glencoyne Pine many times, in each season and in all weathers. On the approach to the pine we have frequently been drawn in by other trees and stood with them, marveling at the patterns in their bark, the shapes they have taken as they have twisted and bent over the years, or their immense size, if they have fattened up and grown way above the others. The installation will feature a haiku – a verse following the Japanese style of short poems, often on the theme of nature, which conform to a number of ‘rules’, including the count of seventeen syllables. The haiku will be revealed word by word on trees along the woodland trail. We have selected six trees, with the Glencoyne Pine as the seventh. Each will be carefully wrapped with a single piece of orange cloth, with a word cut out of it so that the tree’s bark forms the text. The first word will be held by a robust, towering sycamore (whose trunk has an impressive circumference of 426cm), and the final word of the haiku will appear on the Glencoyne Pine. In between these two giants, an oak, an ash, a multi-trunked hawthorn, a slender alder and a huge beech (pictured above) will each host part of the haiku. The walk from the road to the pine takes roughly one hour. The haiku is itself extracted from a larger poem, so with this installation a series of revelations is taking place. At intervals on the trail through the woods, the orange cloth will come into sight, and this will reveal both the bark of a tree and a word of the haiku – and if you pause at each tree there may be any number of revelations, from small features such as moss and insects or patterns in bark, to the wider view of the woodlands, the lake, and the land and sky beyond. We have measured each of the trees, cut the cloth to fit, and hemmed each piece. The next stage is to have the words printed onto the cloth, and then to cut these out as stencils. Later this month we’ll be going into the woods to put the cloth in place with a few people to help – we are hoping for good (or at least good enough) weather for this. The haiku will be in place for ten days, including the day of the public walk we’re leading to the on October 28th. We have chosen to use the seven colours of the rainbow spectrum for the installations, assigning one to each tree. Light is the key element of Rob’s photography (the word photography, literally, translates to ‘painting with light’), and white light is made up of these seven colours (it will refract into these seven in the right conditions, making a rainbow). We’re also linking the colours with the seven ‘chakras’ or energy points in the human body. Orange is assigned to the second chakra, which is associated with sensuality and desire: the exploration of the world through the senses, the right to feel and to have pleasure, and the energy of desire that drives us to move and connect with what’s around us. We relish being outside and experiencing trees and woodlands with all our senses, and we also feel strongly that taking time to get outside and connect with the natural world is not just a good thing, it’s absolutely vital: for health, for wellbeing, and to help us as a species tackle difficult issues in a time of frightening habitat and species decline. Without connection, it becomes more difficult to understand, or to care. This installation involves exploration, movement, an invitation to touch and connect, and in doing so, to pause and indulge in the experience of being among trees. The final word of the haiku on the Glencoyne Pine, which rises more than 50 feet from the ground, becomes a metaphor for the energy of passion that fuels movement, expression and action. As you walk though these woods you will encounter many old, veteran and ancient trees. 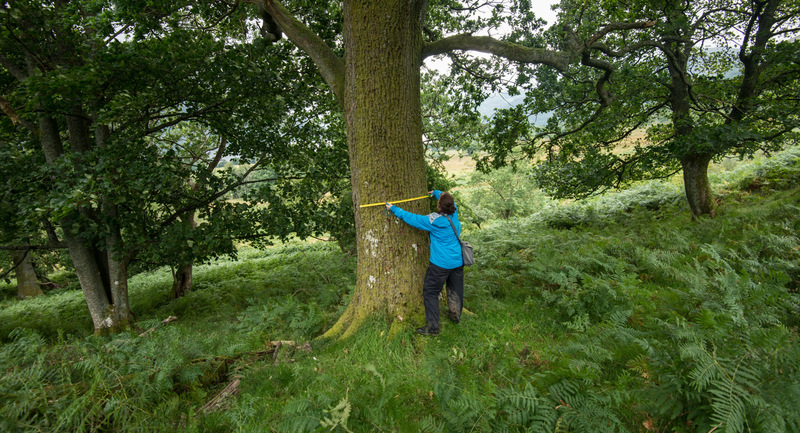 Kerry Milligan and David Preston have recently done a survey of the trees in Ullswater Valley for the National Trust, and have recorded 1100 veteran trees. It is a delight to be among some of them. We have yet to have it confirmed but it may be that the Glencoyne Pine was one of many trees planted in the early 1800s by the Howard family who used the area for hunting. Did they know, I wonder, that their woodland legacy, which is now protected, would inspire so much awe? If you come along to these woods, at any time, you’re in for a treat. Ancient woodlands (those that have been in place for at least four hundred years) have suffered severe decline in the UK. According to Oliver Rackham, one of the UK’s most knowledgeable experts on trees, almost 50% of ancient woodlands were lost between 1945 and 1975 – and we know that more has disappeared since then. So walking through this parcel of trees is unlikely to disappoint. These woodlands are managed carefully by the National Trust and the farmers whose land they are part of, but they are relatively unordered – fallen trees are slowly decaying, huge old trees stand strong with many many decades left in them, and there’s plenty of natural regeneration: a thriving woodland finding its own way, and doing it well. This trail is not frequently walked. The path is narrow in places and can be muddy after rain, and there are a couple of crossings over small streams. Unlike the other trees along the route, the Glencoyne Pine is not accessible – but it is easily viewed from an outcrop just off the path when it emerges from the beech woods. We will post a more detailed outline of the route once the installation is in place.